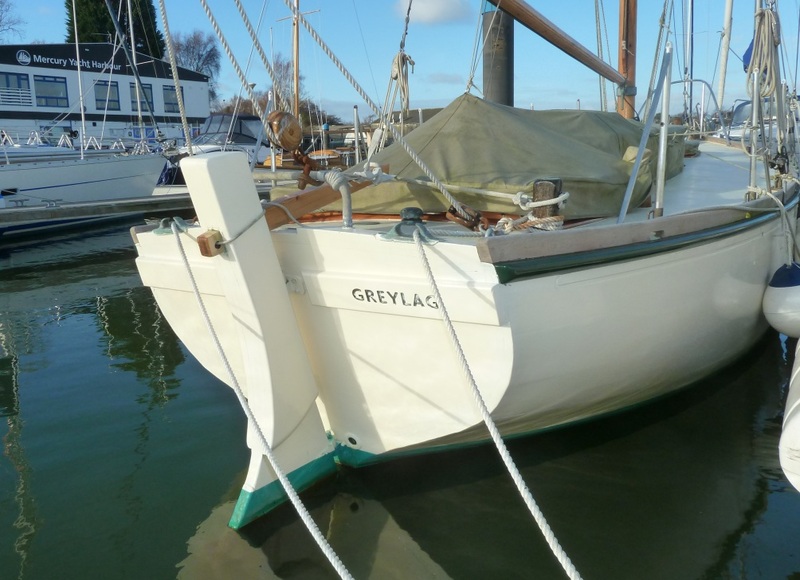 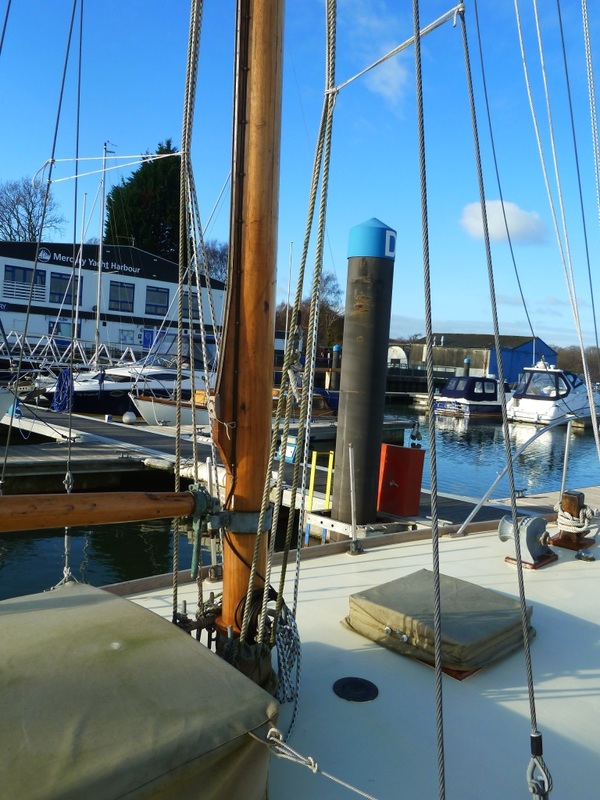 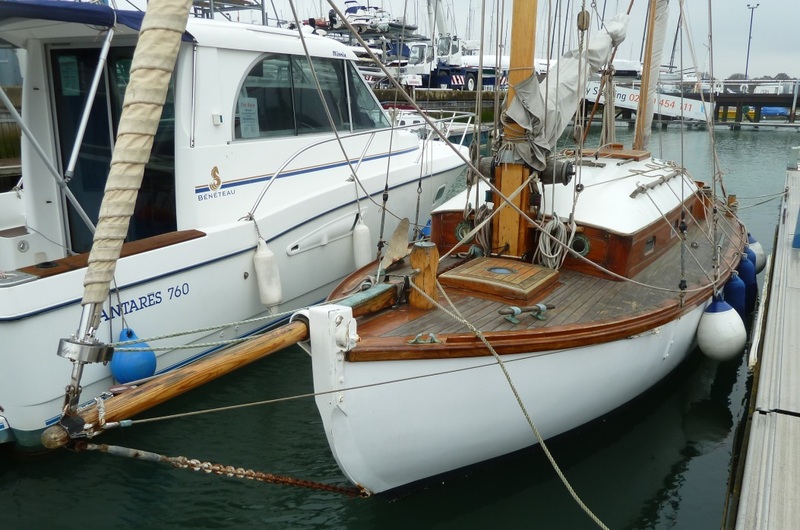 Walking to the chandlers, we spotted this delightful canoe yawl in a Hamble marina recently. 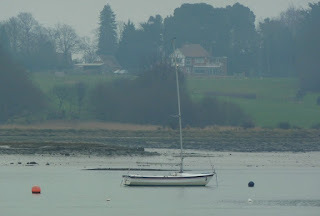 At first thought we wondered if she might be by Albert Strange or Harrison Butler, but further research suggests otherwise. There's an entry on the Canoe Yawl Association site which shows Snippet as a George Holmes design, Holmes was an accomplished and avid sailor based on the Humber, long time friend and sailing companion of Albert Strange, perhaps the most popularly associated designer of the canoe yawl type. 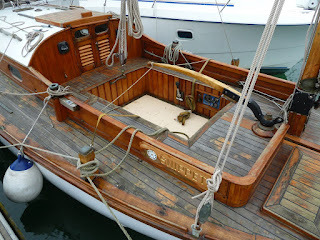 Her construction speaks of quality, just take a look a that cockpit coaming and the bronze tiller stock, lovely. 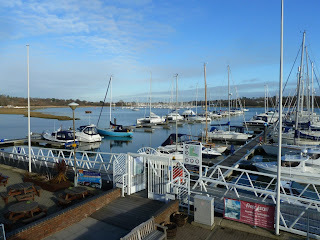 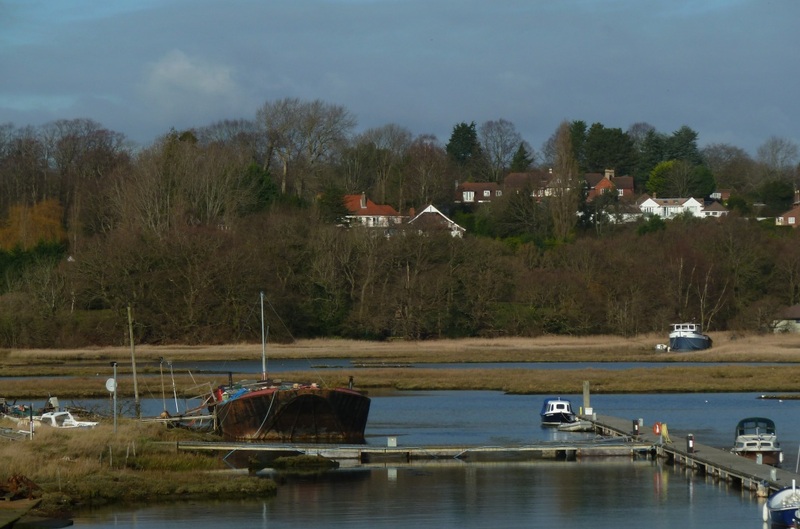 An alternative view of the Hamble, taken from the bar in Mercury Marina which has panoramic views, situated as it is on a bend in the river. 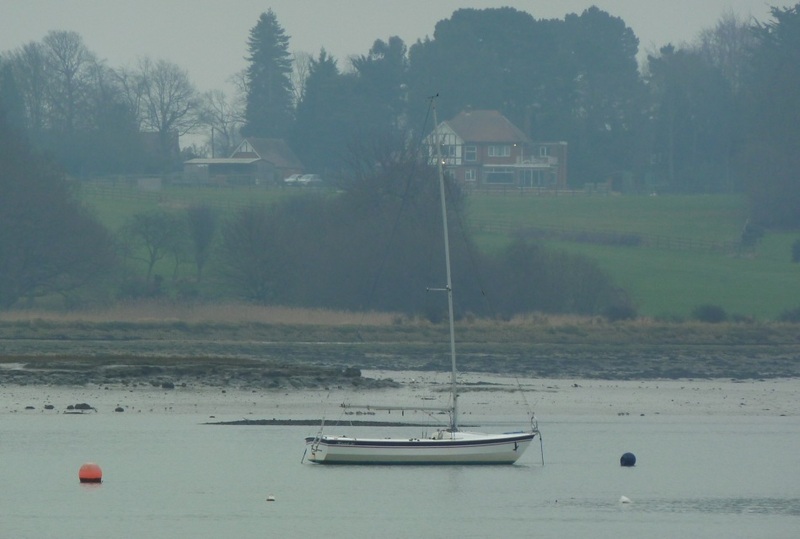 and the quiet, tranquillity of the saltings and the small drying tidal creeks. 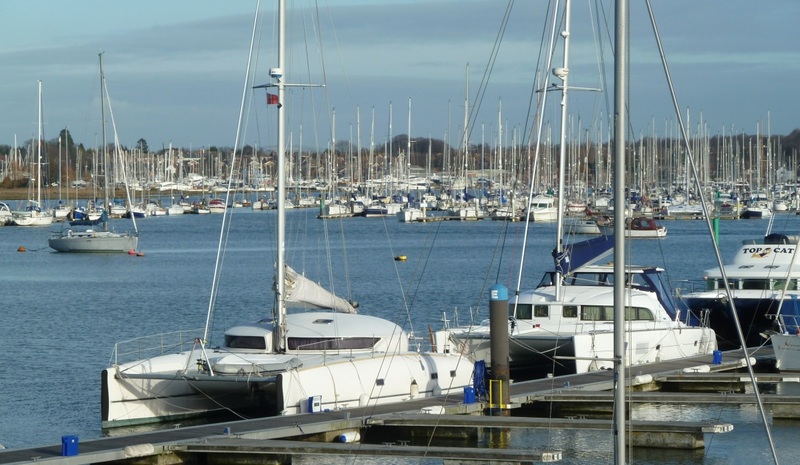 Southampton is one of the UK's busiest ports, it claims to be the busiest cruise terminal and second largest container port in the UK. With so much shipping right on our doorstep, going past the end of the river I don't really pay it enough attention. 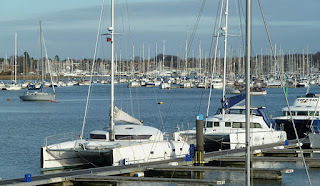 Hamble point is the ideal place to view the oil and tankers which work the BP terminal in Hamble (below) or the Fawley refinery across Southampton Water. 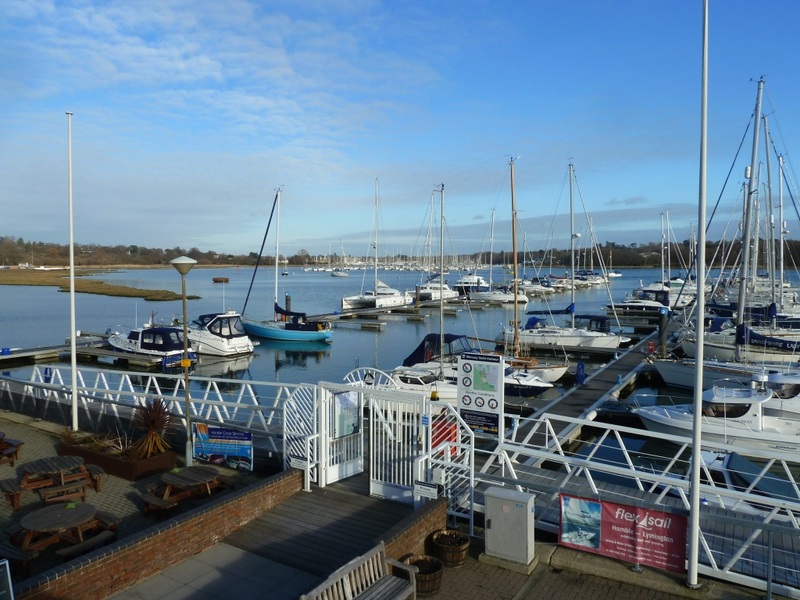 When the Hamble terminal was established in 1924, Hamble Lane was little more than a cart track, George V was on the throne and world was in the grip of The Great Depression, the terminal has come a long way since then but it seems not everything has changed. 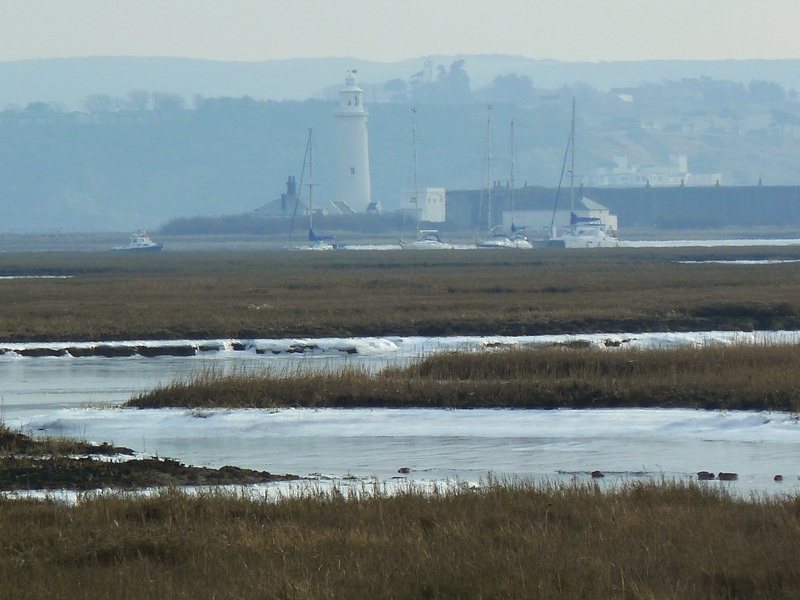 The area immediately surrounding the refinery is unspoilt salt marsh, we often dinghy sail just south of the marine terminal, into Ashlett Creek the contrast with which couldn't be more marked. 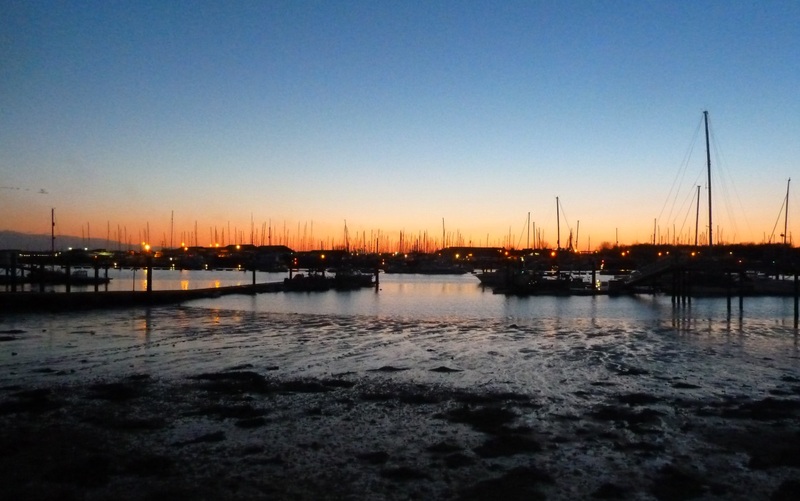 For once we were at the right place at the right time, we'd parked up by the hard in Warsash to go to the Old Gaffers Association AGM at Warsash Sailing Club just in time to catch the evening twilight and a spectacular view across the river to Hamble Point. When we got home curiosity got the better of me - twilight is the time between sunset, defined as the time at which the trailing edge of the sun disappears below the western horizon and dusk, which is the accepted point of darkness when the sun is 18 degrees below the horizon. 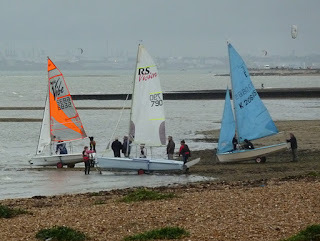 All the other boats are ashore, a cold and overcast winter's afternoon, the sort of day when the view from the yacht club bar looking out is much better than being out on the river. 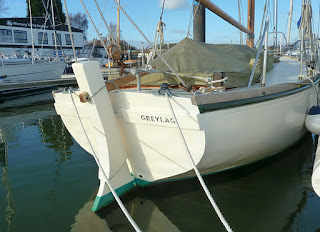 I don't know much about Greylag, she's been on the river for several years, her owner keeps her in very nice condition. 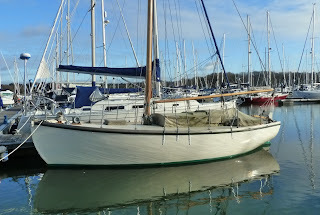 She's normally out on the moorings in the river, near where we kept Greta, but presumably she's been brought into the marina to escape the worst of the winter. 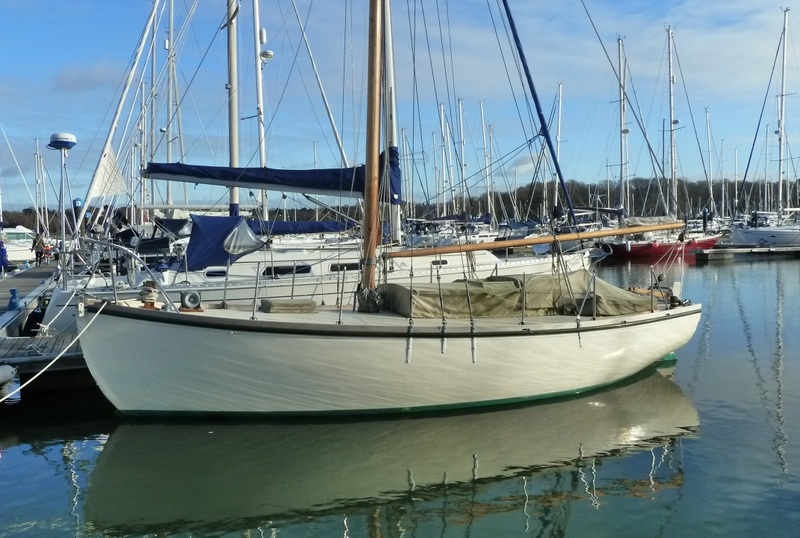 Pure speculation on my part, she has the look and volume of a working boat with her transom rudder, but the curved stem suggests that she was built as a yacht, perhaps by a yard which also built working craft? 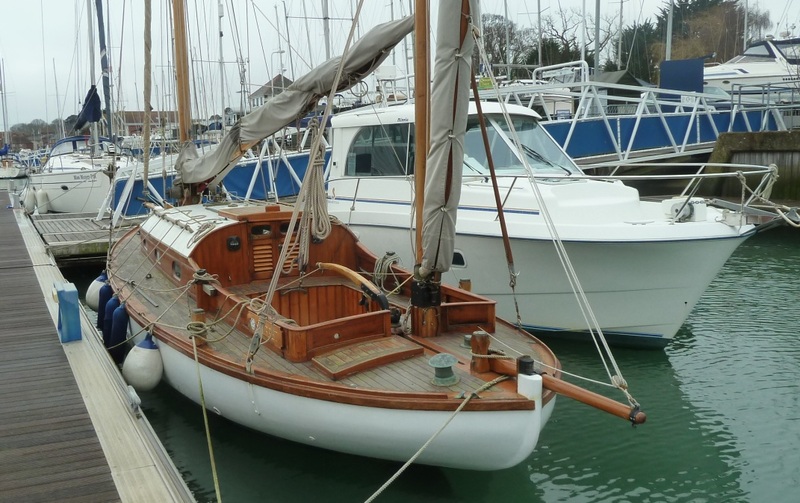 At first sight you expect her to be gaff rigged, but again the tall Bermudian rig speaks again of a yacht heritage. That flush deck gives her a very purposeful look and would be a great platform for working sails and anchor gear. 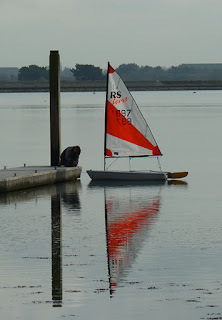 Not a breath of wind all morning. 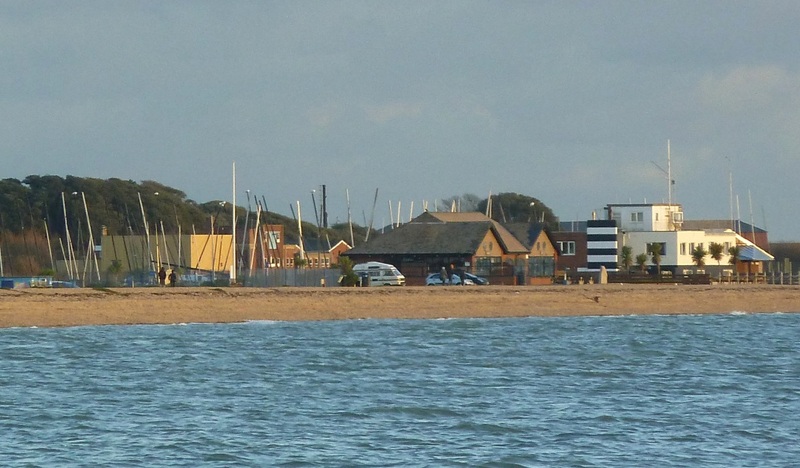 Down on the eastern end of the solent is Stokes Bay, a shallow indent between Browndown and Gilkicker, home to the the Stokes Bay sailing Club and a couple of cafes. 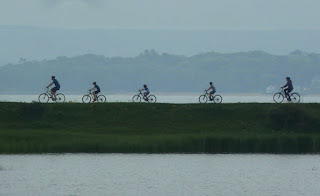 The broad paved walkway follows the shoreline, there's ample (if expensive) parking right at the waters edge so the bay is popular with windsurfers who launch off the shingle, cyclist, strollers or people who just like to park up and watch the ships coming and going. 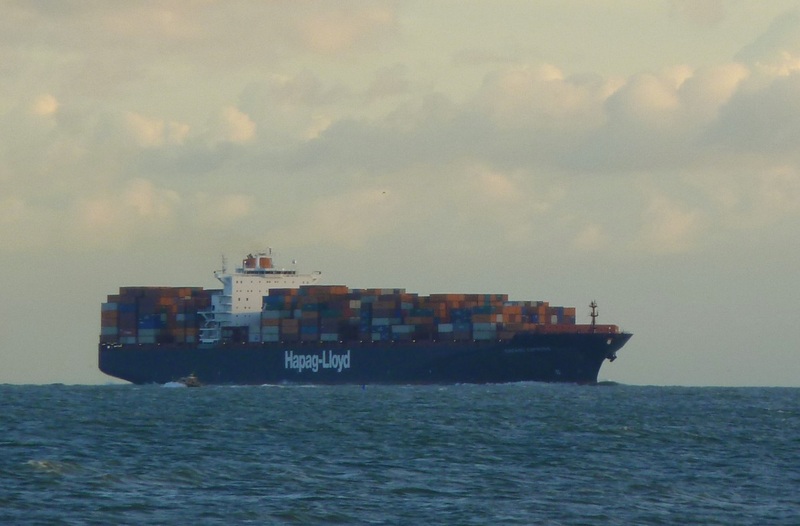 There are views past Portsmouth of the main shipping channel like this incoming ship on its way from the Nab Tower. 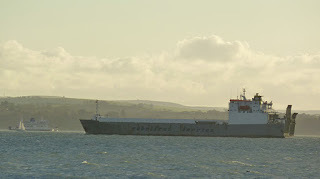 And outbound ships passing down the Solent with the Isle of Wight in the distance. 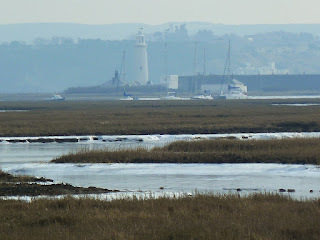 While reports of travel chaos, snow and ice grip the country our bit of the south coast has been remarkably unaffected. 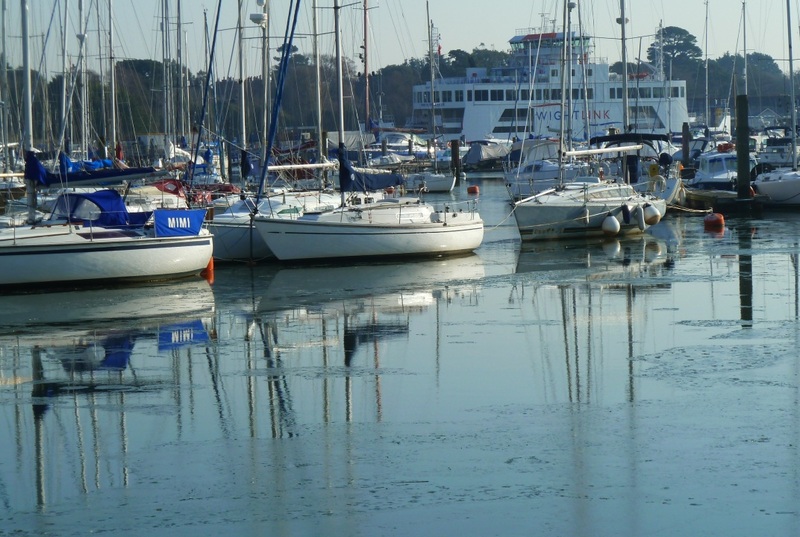 That's not to say it hasn't been cold, as local icebreaker Chris Partridge reports from Chichester. The Lymington river too had a sheet of ice which had formed presumably in part due to the still conditions as well as the -7 degree centigrade overnight temperatures. The saltings at Keyhaven had a think layer of ice, which forms on the exposed mud as the tide fell. Wading birds were out in force concentrated in the margin of exposed mud between the ice and the water. 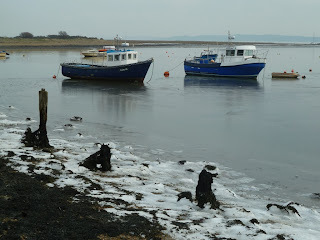 Local fishing boats were secure on their mooring. 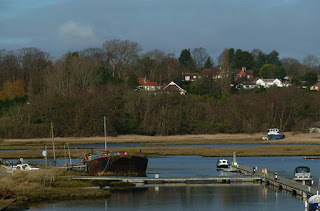 Not far away in local pub "The Gun" a roaring fire was blazing, a welcome haven for such a day. 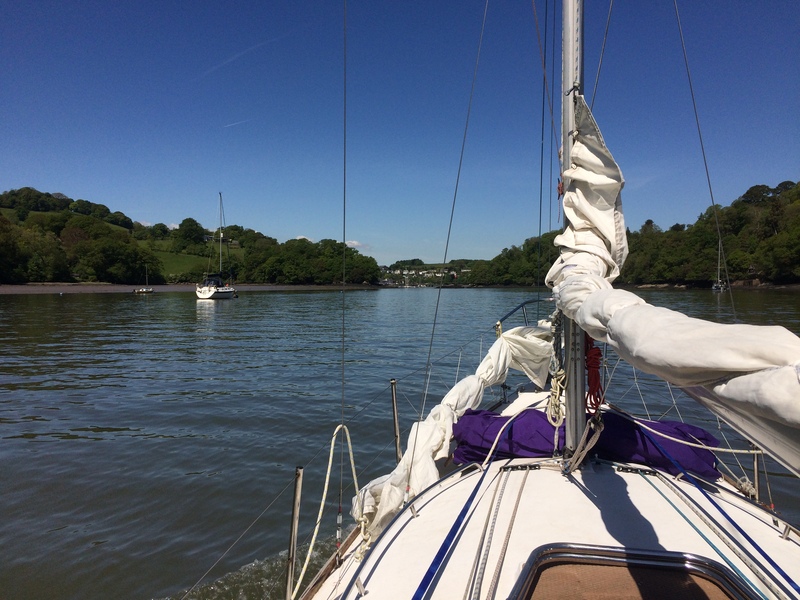 Every year I make the same plan, thinking there will be a few nice, clear and bright winter days on which to get the dinghy out and blow away the cobwebs and the seasonal fug with an invigorating sail. 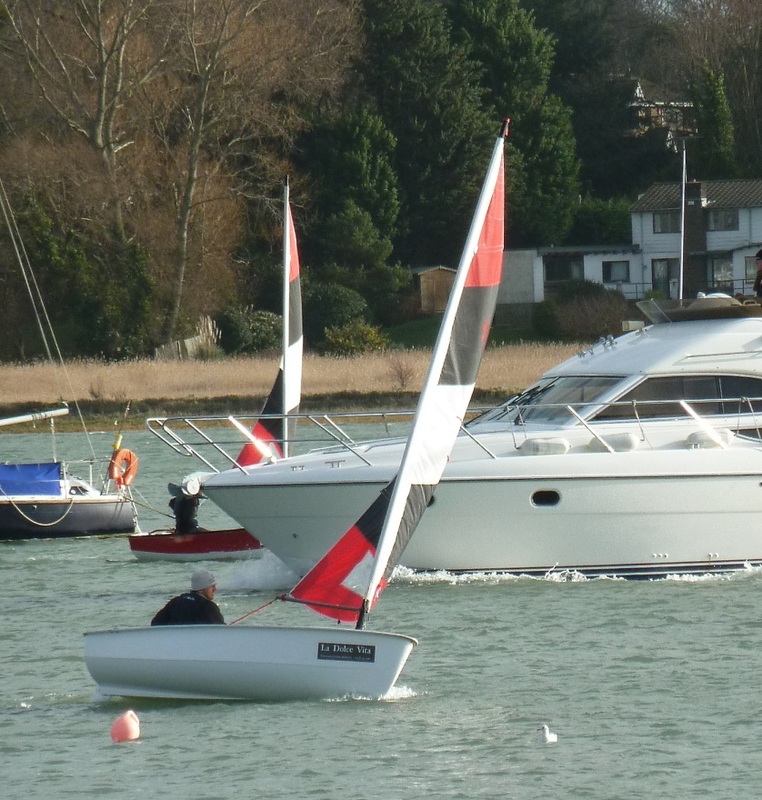 Down on the Hamble the Foxer fleet are hardy types racing every weekend all year round. 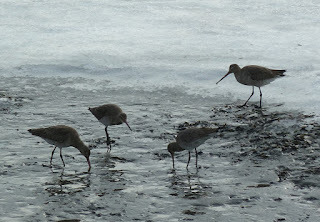 Even in the depth of winter they also have to contend with moving hazards, as the river never seems to be free of traffic. 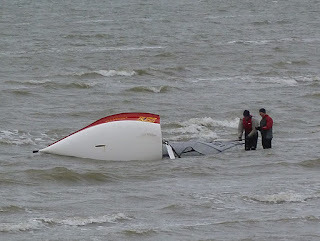 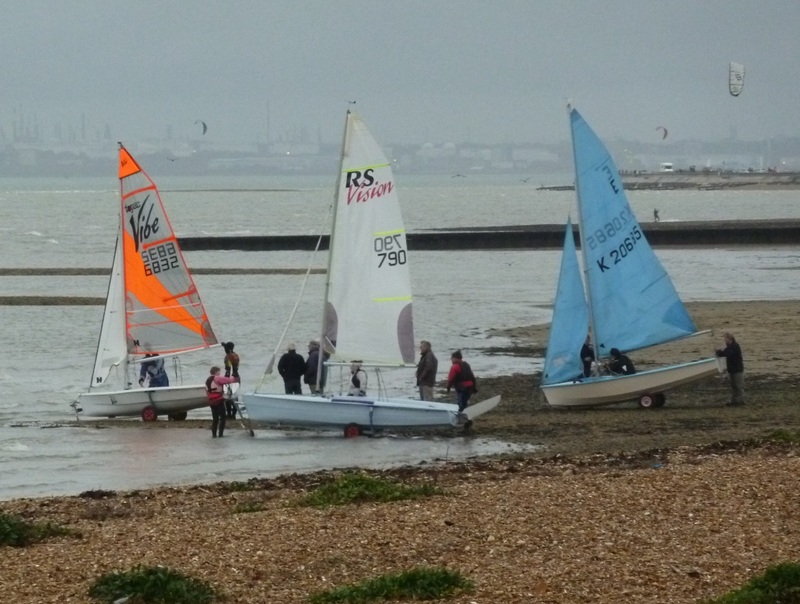 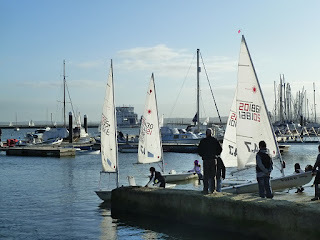 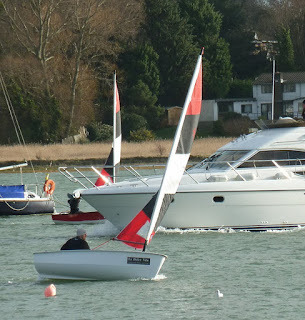 On a positive note the racing was lively on a breezy, January Sunday morning and the high water meant that racing was over just in time for lunch, now perhaps that is perfect winter sailing.